The Meritorious Service Medal is a 1 ½ inch in diameter bronze medal that is made up of six rays expanding out from the top three points of what would be a five pointed star. Two smaller stars outlined with carved edges are within the star. Standing upon two branches of upward curving laurel, in front of the bottom of the star, is an eagle with its wings upraised. A ribbon joins the laurel between the feet of the eagle. Encircled on the reverse side is the inscription "United States of America" and "Meritorious Service." The ribbon for the Meritorious Service Medal has five stripes and is 1 3/8 inches wide. The first stripe is 1/8 inch in Crimson, the second is ¼ inch in White, the middle is 5/8 inch Crimson, next is ¼ inch and White, and the last is 1/8 inch Crimson. The acts or services that justify the awarding of the Meritorious Service Medal must be equivalent to that necessary for the awarding of the Legion of Merit, only performed while in a duty of lesser degree but still significant responsibility. It is awarded to a member of the military of the Armed Forces of the United States for having set him or herself apart from his/her comrades by outstanding non-combat meritorious achievement or service to the United States after 16 January 1969. 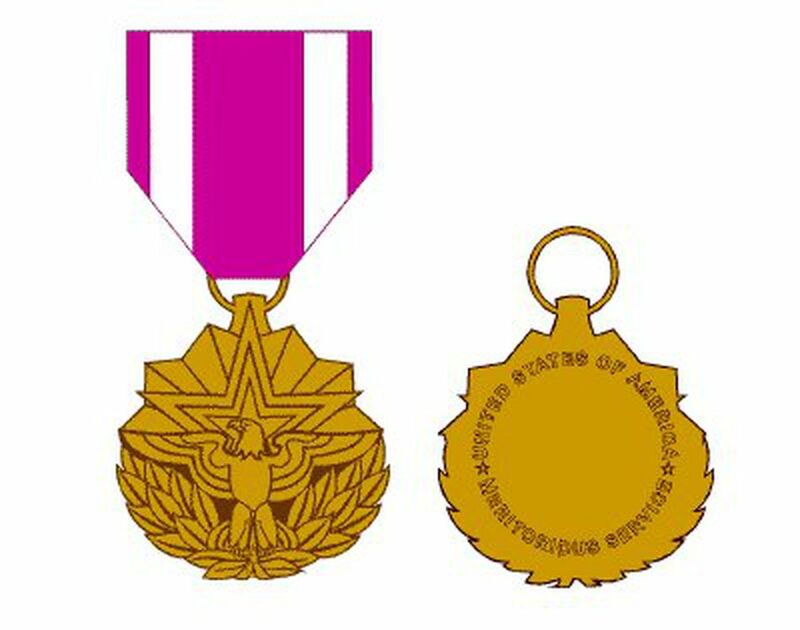 On 5-6 February 1968, at the Tri-Department Awards Conference, a discourse was held regarding the necessity for another meritorious award that would give the proper acknowledgement for noncombat achievement or service equivalent to the Bronze Star Medal for combat achievement or service. It was thought that the Legion of Merit had been used much more often to honor service that was of a lesser standard than the Legion of Merit standard, yet greater than that necessary for the Commendation Medal. In April 1968 a proposed executive order was ready and sent to the Military Departments for approval. A name was to be selected by an ad hoc committee created by the Secretary of Defense. The name "Meritorious Service Medal" was unanimously approved by the committee on 8 November 1968. Executive Order No. 11448 dated 16 January 1969, by President Johnson recognized the Meritorious Service Medal. President Reagan, per Executive Order 12312, dated 2 July 1981, amended the order to approve the awarding of the Meritorious Service Medal to award service members of armed forces of friendly foreign nations. Mr. Jay Morris of The Institute of Heraldry designed the decoration that was approved on 20 March 1969 by the committee. The similar colors used for the ribbon design and the Legion of Merit accurately show the similarity between the two awards. An eagle, as a symbol of the nation, standing on laurel branches represents achievement. The star stands for military service, and the rays coming out from it symbolizes the continuous actions of persons to achieve through excellent and meritorious service. Who Gets an Army Achievement Medal? What Do the Air Force Ribbons and Medals Signify?